Universidad Carlos III de Madrid (UC3M) and Ericsson have launched a Master's in NFV and SDN technologies for 5G networks with the collaboration of IMDEA Networks This program, which will be taught at the UC3M Madrid-Puerta de Toledo campus and the Ericsson Auditorium in Madrid, is the product of a long-standing collaboration between both entities in the area of education and research. Ericsson and UC3M have identified 5G and related technologies such as NFV and SDN as areas of great potential for the development of talent in Spain because of their importance in the digitalization of industry, and because they will be the technologies that respond to the growing volume of data traffic, expected to increase 40% per year from 2017 to 2023. 5G technology is growing in importance, and it is estimated that in just five years, it will have billions of subscriptions covering 20% of the world's population. In addition, studies by Ericsson indicate that 5G will be profitable for Spain, generating a market of 23.3 billion euros in 2026 from the application of this technology to the digitalization of industry. It is expected that talent specialized in 5G will be in great demand in the ICT industry and vertical sectors such as energy, manufacturing, public transportation and tourism. Moreover, educating talent in the most advanced and disruptive technologies of the telecommunications industry will contribute to creating the 5G ecosystem in Spain. The program has a highly practical component. It will be taught by UC3M engineers and professionals from leading companies in the industry, such as Ericsson, Acciona, Dell and Telefónica, among others. Twenty-five percent of the class hours will be held at the IMDEA Networks laboratory as part of 5TONIC, the top European testbed for 5G technologies that also counts with Ericsson, UC3M and Telefonica amongst its members. The Master's degree program is modular and is designed for both recent graduates of the areas of ICT and telecommunications professionals who wish to combine it with their work. Grants for the program will be offered so that recent graduates with excellent academic records can choose to study while doing their internships at Ericsson España. These students have the opportunity to pursue the Master's degree and carry out their internships under the guidance of highly experienced engineers. 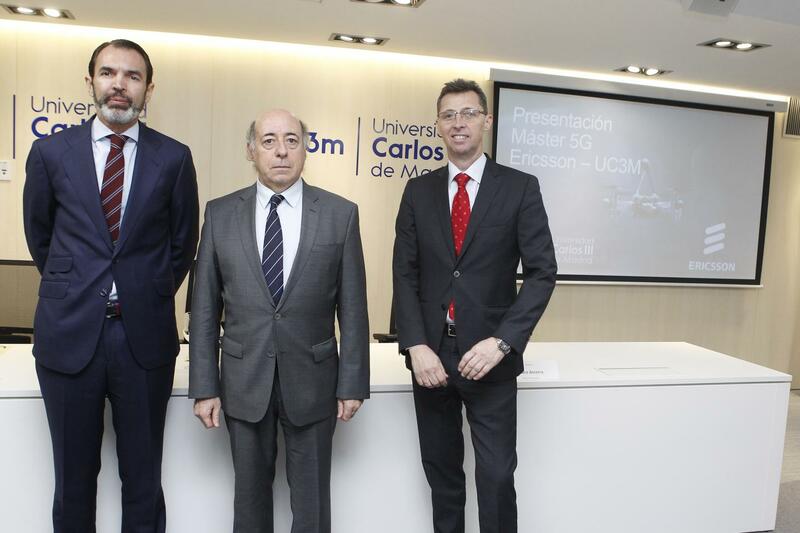 The Master's in NFV and SDN for 5G networks was presented today at a ceremony which took place at the UC3M Madrid-Puerta de Toledo campus and was inaugurated by its rector, Juan Romo. The rector explained that "in 2015, the University, in collaboration with Ericsson, foresaw the need to create true international specialists in network and service virtualization technologies, specialists who would be able to apply the best theoretical and practical knowledge to virtualization and cloud projects. Such projects are now commonplace in the field of telecommunications and are the backbone of next-generation 5G networks." Furthermore, José Antonio López Muñoz, president and CEO of Ericsson España, noted that "5G will be fundamental in the digital transformation of Spain, so we have to develop talent that will make 5G and its use a reality, not only in our industry but also in other sectors. With Carlos III we have already developed 180 specialists in virtualization through our courses on NFV and SDN, and now we are proud to present the first Master's in 5G." Arturo Azcorra, IMDEA Networks director and UC3M professor in the Department of Telematics Engineering, explained: "Network functions virtualization (NFV) technology and software-defined networking (SDN) technology make it possible to export the cloud/edge/fog model to the new generation of 5G communications. In tandem, these technologies make it possible to substitute network nodes based on specific hardware with general-purpose hardware, reaping benefits that include the reduction of infrastructure costs, the rapid deployment of applications, services and infrastructures to achieve the goals set by companies in the shortest time possible, and the creation of new kinds of applications and business models by companies, which benefits them and increases the value of their networks." Lastly, Pablo García Estévez, senior expert on innovation at Ericsson España and student in the specialization courses on NFV, SDN and 5G networks, said, "The Carlos III-Ericsson program has demonstrated to me that it has the best researchers and professors on these subjects at the University, along with the participation of the top experts in the industry. In addition, as enrollment is open to employees of other companies and recent graduates, it is a privileged networking point in the Autonomous Region of Madrid for these technologies."